.... I completely forgot about community day. Facepalm. Have you seen the game news? They're introducing Clampearl to the game the same way they did with shiny Feebas! Three hours of field research tasks that award you Clampearl encounters. Its two evolution forms will be random so you better get as many as possible! You'll need 50 candy for an evolution so make sure you feed those clams with pinap berries. Nice news on my part - I hatched a Bonsly and a Happiny and I'm so happy about having those babies, they're so cute! I also hatched a Mawile today, though I can't remember if it came out of a 7km egg or the 10km egg as it was a hatching bunch. I'm guessing it came out of the 7km egg that I obtained during Hoenn celebration. Probably a 7k egg from the celebration, I hatched a mawile during that too. I'm excited about the clampearl thing. I didn't know that the evolutions would be random though, that will make it more difficult. I also hope this means that clampearl will continue to be available, even if they are rare. It has been confirmed (on twitter I think) that Clamperl will be available in the wild after the event! Which is good news because I probably won't be able to play much. I do hope that the quests will be a little less time-consuming but let's see. I'm less than excited about the new event mode that's been introduced with Feebas. 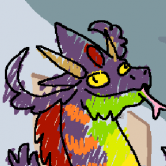 I won't be out on saturday for Clampearl so I hope I'll get one later. Caught a second Lugia yesterday. Theoretically I have one more chance for a legendary, but since I have all of them I won't go for a shiny and wait for the mon that'll be introduced for the breakthrough in march. My phone wasn't able to take AR pics before, so I don't think mine is working right. It only shows the front view of the pokemon, no way to send it out, it's just already there, and then I can't walk around the pokemon. It's like its an overlay on my camera. That's the "ordinary" AR. For AR+ you have to download AR Core (it tells you whether your phone is compatible) and then activate AR+ in the settings of Pogo. My phone isn't compatible with AR Core unfortunately... That's for Android btw, I don't know how it works for iPhone. So about the Clamperl event - I had a blast! It was one of the best events this year and probably in general as well. The quests were easy and fun, there were tons of evolved forms spawning (I caught e.g. Kingler, Marshtomp and also a Lapras!) and the shiny rates were much better than for Feebas. I am aware that a lot of people don't have a lot of pokestops, which is very unfortunate for this kind of events. But I'm glad that this event went so much better than the Feebas event. It hailed all day and I couldn't get out for the event, but I did get Ho-oh for my breakthrough this time. I caught quite a lot of Clamperl yesterday! Also got my first ever Latias from a raid and I'm super happy about it, now I have to wait for Latios to make its second appearance so I can get him too. When it comes to Clamperl, I didn't know there would be a shiny at first, which is why I was really surprised when my second Clamperl turned out to be a shiny. I caught a lot of them, but sadly I didn't have enough pinap berries to get double candy from all of them so I was only able to evolve four of them. I traded one shiny Huntail because I couldn't get a shiny Gorebyss (my friend was kind enough to give me one in exchange), and as my shiny goal is complete now I have to try to get one regular Huntail male and one female, and also a male regular Gorebyss, hoping that I will have one male and one female regular Clamperl left. This is why I didn't transfer many Clamperl at once. When it comes to other water type pokemon, I tapped every single Wingull, Psyduck, Krabby, Magikarp, Wailmer and Feebas... not a single shiny. 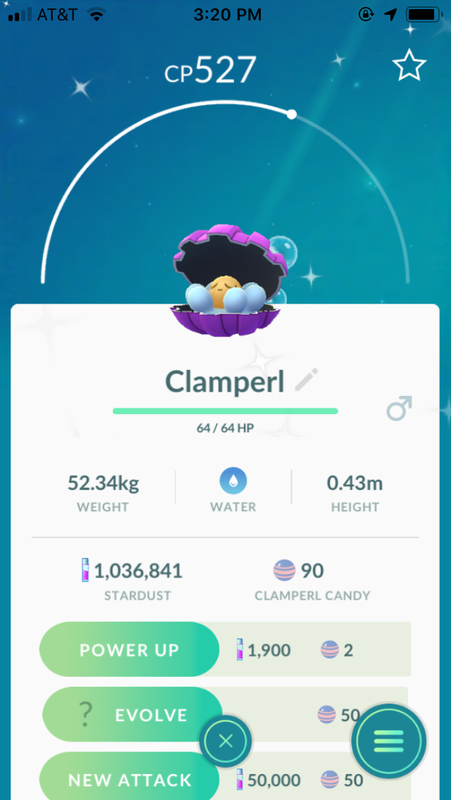 I was able to catch a few clampearl and I even caught a perfect IV one! No shinies though, I had a few feebas so I'm closer to my Milotic. Did not get any shiny of the others either this time. But I think I may have used my shiny luck for the community day when I caught 7 shiny swinub. I was able to get just enough candy to evolve one feebas and it turned out to be a gorebyss like I wanted. I'll have to start walking Clampearl after the feebas and hope for a quick huntail. I think I'll try to go to the city for the next event like this. I'll definitely have better chances of a shiny and stops there. I ran out of pokeballs yesterday and am stuck until I can stock up on more. My trainer code: 7125 6831 8871. Ahhh, Okay. That makes sense. I have a Galaxy J7 so I'm curious to know if it would. I've had the phone for two years and it's done really well. I had a really good time during the event. I ended up with 36 Clampearl and in those 36 I got 5 shiny ones (all male... was hoping to try for a female Gorebyss) I also found a Shiny Magicarp and hatched a Shiny Absol! My friend was like, ".....Boi!" The funny part came from the last few minutes. We met up with another friend and he was like, "I got two shiny pearls and a shiny Squirtle." I told him about my Absol and he was like, "I curse thee." I click on my last research claim and it was shiny. The look he gave me was hilarious, and I was like, "Thanks for the luck!" It was all in good fun tho. I definitely had a blast. @*Silver Fox* 544CP is a 100% Clampearl My best one was a 536CP which was a 93%. Apparently, for some people it was bugged and they didn't get one even after over 1.000 encounters? What should happen is that when you use the new camera function (both AR or AR+) to take a photo of one of your pokemon, there's a chance Smeargle will photobomb you. It's pre-determined whether it will appear in the photo session or not, so if it appears, then it does so on the very first or second photo. So if it doesn't appear then, exit the camera mode and re-try. After Smeargle photobombs you, it will spawn next to you on the map (so don't you use this feature in a moving vehicle). Got a Moltres from the research breakthrough today and a Sinnoh stone as reward, so I was able to use it as second item to evolve a mon and I'm at the last stage of A Ripple In Time! Only need to catch 40 Grass or Psychic pokémon and land an excellent curveball throw (something I've gotten surprisingly good at, so shouldn't take too long)! The Smeargle feature is incredibly cute, the first time I got it was with an Alolan Dugtrio, the second time it photobombed Giratina. That was so incredibly cute and funny. I finally gathered enough candy to evolve my wonderful Finneon to my first ever Lumineon, and I also caught one wonderful Cranidos which I evolved to Rampardos. I now put Clamperl to be my buddy because I desperately need more candy to get the remaining evolutions I need. Finally got a Smeargle after the first one I encountered ran away. Glad that's done ... I don't like Smeargle so I don't need to catch more than the one. I even have two Smeargle now as I've been showing a friend of mine how to get one. I'm currently savong pokedollars for clothing ... not that I wouldn't need more useful stuff, but ... screw it, I was sick of short skirts and hotpants and leggings and bought a skinny jeans ... next is the Team Red longsleeve! Also caught a Kicklee yesterday! My first one!